I can't wait until you want to cuddle with us. Right now you are just so wiggly and "up" when we are tired so it's hard to just squeeze and cuddle you. One day soon we will all be able to nap and cuddle together, just like when you were a squishy newborn, it will come sooner than I think I bet. You are working so hard when you are awake now, taking everything in - especially the pictures of mommy and daddy on the wall, the dogs and all of the fabrics/colors of your blankets/pillows. 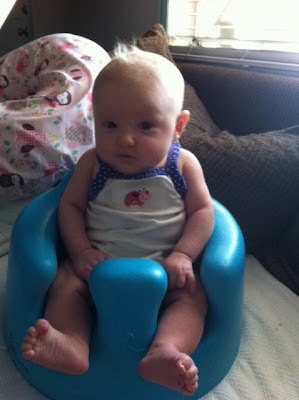 You are getting so strong, holding your head up and sitting in your bumbo, you are such a big girl. 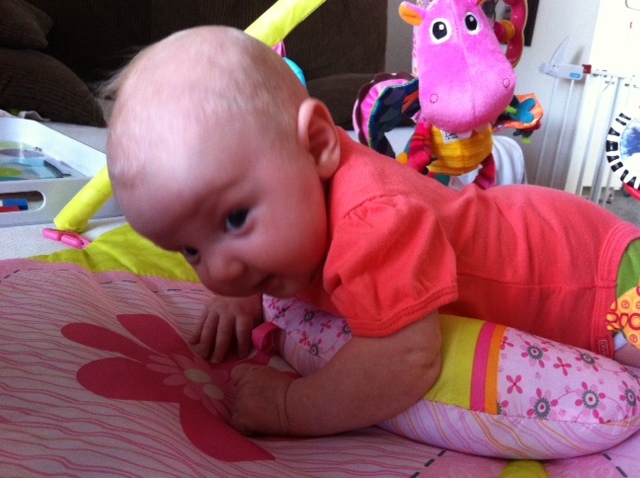 You still hate tummy time but are getting so good at lifting your head up when you get mad and start to kick. You even have this new back bend thing going on (you do it while I'm nursing you too), where you arch your back and lift both your legs (kind of like locust pose in yoga!). This will eventually propel you over from your tummy to your back and you are so close! Speaking of those legs, they are so strong, when you get mad (because I have to stop and burp you while eating) you stand all on your own and we can't bend your legs, no matter how hard we try. Your reflexes are nuts and when I try to cut your toenails you do the same thing with your toes, I just can't bend them! You are getting better at sleeping and your night time routine is getting more comfortable for all of us. You don't need to eat constantly at night (and don't act like you have to) and you let us take you for a walk and give you a bath without acting like we are starving you. You are going to bed before 9pm every night and sleeping 6-8 hours before waking up to eat (8 hours the night before last!). Getting you back to sleep for a long period in the morning is tough though and usually after that long stretch you only sleep about 2-3 hours for two more times before you are up and this make me really really sleepy. But then you will go back to napping after being up for an hour but by this time I am up and have already found a million things to do around the house so I can't nap with you. This morning nap is usually really long and the last couple of days your afternoon nap has been pretty long too. Every day it is something new so I know your schedule will change again before I know it so I am just taking these tired days as they come, knowing that we will all get rest again soon . . . maybe. I can't believe you are 11 weeks old. It sounds like such a short amount of time and I can remember when you were in my belly only 11 weeks ago, but then again it seems like you've always been here with us. Almost 3 months old - it is going by WAY too fast. We are getting the hang of nursing and you are gaining weight like a champ. 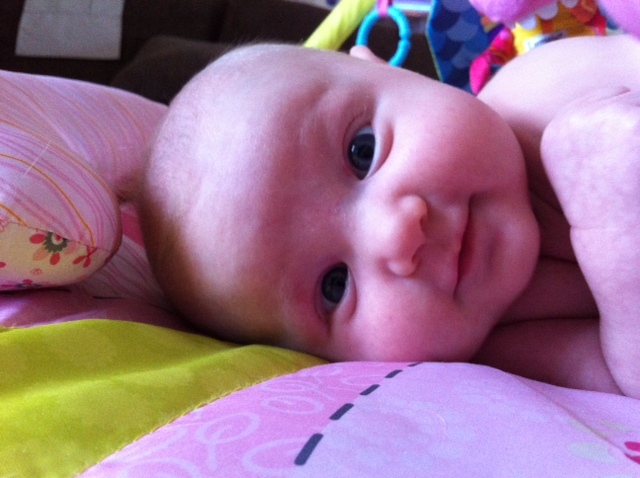 At your 2 month appointment (9 weeks) you weighed 11.4 pounds (57th percentile) and were 23 inches (70th percentile). And your head measured 15.5 inches (63rd percentile - big like your daddy's). You got 3 vaccines at that visit (one was oral and 2 were shots) and were such a good girl waiting in the waiting room for an hour before being seen, you didn't cry or get fussy once. And when they gave you the oral medicine you were so happy, just smiling, talking and looking around until that first shot where you cried and cried, not knowing why anyone would hurt you like that. It broke my heart to see you so sad and the 2nd one was even worse. I held you and nursed you while your Nani got our things together, I am so happy she came with us that day. That night you were so tired, went to bed so early and slept for 8 hours. The next day you were fussy and I could tell that you didn't feel well and that lasted for about 2 days. You were such a good girl, even so, and I felt so bad that you didn't feel good. It's nice we don't have to worry about more shots for another month - phew! My favorite things you do lately are "the lip" when you get sad (see video below), how cuddly you are when we have to wake you up from a nap, how you smile and smile at us when you're being changed (still), how you are trying to laugh when daddy whistles and how you have just started to really sit up in your bumbo. All of these make me so happy but so sad because I know you are growing up so fast. I have had to put away some clothes already and you fit in less and less each day (that's why I have a terrible Instagram "closet" addiction at the moment) because you are just getting so big. I even took out your infant insert from your car seat last night! My little girl is growing up so fast and I am dreading going back to work and leaving you. I will miss you so much. You are still spitting up like crazy but I think it's getting a little better. We bought gripe water and tried that, gas drops and Zantac but just the Zantac every day (3x 1ml) seems to make a difference. No projectile spit up lately which makes me happy (because I can tell it hurts you!). You burp often and loudly and I think it's good for you and makes your tummy feel so much better. But the reflux is probably why you don't like tummy time and who could blame you! You recently made a friend named Livvy who also has reflux and her mommy, Melissa, has helped me so much in suggesting a schedule for you to help you feel better. It has helped and every day I wish that you start feeling better and better. I can't give you enough kisses lately or smiles to try to make you smile. I love to pet your head, your hair is so soft (even though there isn't that much of it!) and your skin is so soft too, I love petting you all over. I have tried giving you a baby massage at night after your bath but you're not into it yet, maybe one day. You are my best friend and I love spending the day with you. 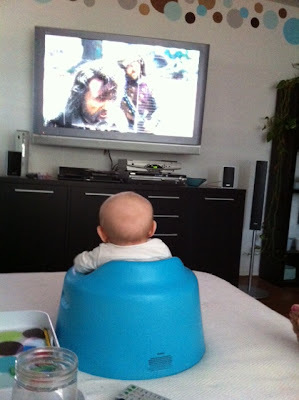 When you wake up it is the best part of my day, even though it gets harder and harder keeping you entertained and busy. You are the cutest thing I've ever seen in my whole life and when I look into your eyes it is magical. Sometimes I just stare into them, seeing all that you see and seeing myself in you also. It is the most incredible feeling and indescribable to someone who has never been a mother. You make me so happy and it feels like you have been here with us forever, I don't remember life without you. Little girl you are the light of our lives and we are so incredibly lucky to have you. I love you so very much. A couple of weeks ago I attended a yoga class at my studio called Yoga for Mindful Mothering. I didn't really know anything about it when I went, other than the fact that it was for moms and you left your baby at home - and that we'd be doing some yoga. So, I was all about it and was excited to go since it would be the first yoga class I'd be going to by myself, since I was pregnant just 7 weeks before (so crazy!). The class was $20 and was 2 hours long and I was so excited to go with a couple of my prenatal yoga friends, Ann and Amy (who also now have little girls), and to see our former prenatal teacher, Evon. The first half of the class was great, a kind of standard yoga practice that got my blood flowing and put my muscles back in action (Mommy & Me is yoga but in between entertaining your baby so it's tough to get a good practice in). The other moms seemed great and there were about 12 people in the class. After the yoga practice we went around the room to introduce ourselves and there was a mom with 2 year old triplets (yikes!) who shared that she had taken this class before (when it was offered monthly) and that it changed her life, opening up new possibilities to her just because she set her intention there and then made what she wanted to happen, happen. That's what I like to hear. Of course when they got to me and I told them why I was there, what my issues were, I talked about breastfeeding, shed a tear and got to hear some feedback from the other mothers telling me that it gets better. I hear that a lot and every time I do I just hope that it does and that I don't give up before then (and it has gotten SO much better so I'm only looking forward from here!). After the introductions, Evon went on to say that every time she has led the discussion in this class she has been asked, afterwards, to "up it" and make it something even deeper. Here we thought we would be talking about being a mother, sharing, learning and growing together but instead Evon launched into a discussion about awareness. It wasn't what I expected and at the time it was WAY more than I had bargained for (or was mentally prepared to handle), and something that was really out of my realm of thinking at the moment, but it turned out to be exactly what I needed. Weird how that works out. Evon started with a quote: "Who you are inwardly expresses itself outwardly." And then she went on to say that, "Babies are not defined by their emotions. They express them. We were all those little babies. We came out knowing everything was ok then life gave us different messages." Isn't that something to think about. We know everything we need to know, our bodies and minds already know it so why are we constantly doubting ourselves? This really hit home with me because I have said, many times, that I felt so confident in giving birth, in both labor and delivery, and it turned out mostly like I had planned. I had faith in my body and knew what it was capable of and was so confident that it would do what it needed to do to get the baby out, without any unnecessary interventions. And I was right, it did. And then, I had this baby, and this same body that worked in such harmony for me and for Lemon, is the one I was fighting with in regards to breastfeeding. Why didn't I have the same faith? It was, after all, the same body, and it knows what to do and how to feed my baby, without me even getting involved. Why was this so hard for me? "Unwind. Take the ball of yarn and unwind it and get back to the core of who you are. Be aware. Be aware. You find contentment with awareness. Being aware gives us freedom. Believe that things will work out. Visualize what you want." Ugh, couldn't we all use this advice as mothers? I constantly feel like I have so many things standing in my way, I am so wound up and not aware, not open to what I can do, what my body can do. I do not trust myself most of the time, feel blocked literally and figuratively. I thought: Can I get past this? Am I blocking this? Can I overcome? Awareness can help, it can help all of us. I feel like, listening to other mothers, that this was something I should be able to do (nursing), something that comes naturally and something I should be good at. "It frustrates me when someone does something different than me. The awareness comes from inside. Realize what you are doing, something you're feeling. Self inquiry, being curious, diving in comes after. Being aware will then guide you through what will happen next. No judgement." We are truly our own worst enemies and me thinking that I had to do better, that's what was standing in my way. I was feeling the judgement, I was judging myself. We all judge ourselves constantly and don't understand why things are so easy for some and not for others. We want them to be easy for us, just like everyone else, but we are all different and WAY too hard on ourselves. I had to have confidence that I could do this. I told the moms in the class that I had to get out of my head, that I was the only thing standing in my way. I told them that reading or watching TV helped, helped me to think about something else and not about what I was doing, allowing nursing to come naturally. "Whether or not you are watching TV, the awareness is there." The awareness isn't there because I made it there, it has always been there. "Be confident." This was my mantra. This is my mantra every day. Evon told us about her son's teacher at school who had two rubber bands hanging on her bulletin board. At the beginning of school she told the students what they meant. "If you're really good at something, don't stretch the big rubber band bigger. Go stretch that little rubber band bigger, that is something you aren't that good at." We have to realize that we can't be good at everything, that we are NOT going to be good at everything. There is such pressure for women and mothers. It becomes a measure of self worth if you aren't good at something. We have to remember that there is no right way, just the way that works for you and your family. Wow, you can say that again. There is no right way, just what works for you. Now I realize that you all aren't struggling with breastfeeding like me so my own thinking here will not apply to you. But, the fundamentals are the same. These things, this topic of awareness, does apply to everyone, no matter what you are having trouble with. We can't forget that it is always there, we know how to find it, how to tap into it; and once we do - it will set us free. However, we identify with certain things and then we say that's who we are. That may not be what is true. "The core of who we all are is exactly the same. Biologically we all are the same. Same morals/values, same goodness." As I've also said before - we are all one (it is even scientifically proven). It is what "namaste" actually means when you say it at the end of yoga - "When I am in that place in me, and you are in that place in you, we are one" (I even put this in our wedding vows, that's how much I believe in it!). Strengthen that connection to the self. If we, as a society, remembered that we are all in this together, things would definitely be different. Duh (right?!). "Let go of the details, they get in the way of acceptance. The mind does this. We are afraid of how big we can be so we try to stay small. We don't expand our potential because of this. Being a mother is doing something bigger. Connecting. It is said that 'Motherhood is the fast track to enlightenment.'" I believe this to be true. You see yourself in your child, those eyes you look at mirror you, it is the most aware I think I have ever been in my life - while sitting and looking at my daughter. It is a huge responsibility to become aware, to set yourself free of what is holding you back. Even the other day, while thinking of this post, I took a step backwards in nursing, I thought too much about it and then Lemon had a really late night because I don't think she was getting the food she needed (or it wasn't coming fast enough for her). I was in my head too much again, even though I haven't been for awhile now, and things were going great. "Look inward and your ability to be more aware starts with you. Be present - how am I feeling? Instead of reacting, just be aware." I have to practice this myself, every single day. We forget to do this, to check in with ourselves, especially when we are so busy caring for someone else. "Awareness is never not there, tap into it. It happens without judgement and labels and "shoulds." We want to fix and solve ourselves so we can be better; but if we really got it and just became more aware, our lives would be simple and we would be more content and joyous. Simple expectations. "Stay aware and you will grow." What an amazing thought, what an amazing feeling. Keep it simple. I tell my high school students this all the time - why can't I live it too? We get too wrapped up in how we should be or how things should go, but if we just kept it simple and didn't have these "shoulds," then we would just be content in who we are and what is. We would have awareness on actually what is and then that will allow us to grow. Interesting. "If we begin to condemn what is or blame/resist then we will not understand the movement. You must love and not condemn what you are studying. Don't condemn/resist/blame because you will not comprehend. Observe what one thinks/feels/does at the moment - that is the actual." Does that just blow your mind? Read it again, think about it - did your head explode?! Do you feel enlightened just a little? So, overall the class wasn't so great (because an hour to discuss this is NOT enough time) but the message was there, and I felt like it was there just for me. I had to run because I didn't want to leave the babe too long (and her end up getting more bottles) so I left on time, even though some of the mothers stayed to chat more about this heavy topic. It was a lot to take in, and not what I was expecting from a mother-centered class. But, it really hit home for me and ever since the class, things have been better (believe it or not). I seemed to have gotten out of my head, about nursing and about everything, and have taken a more relaxed approach. I have tried to live in the moment and enjoy every second of motherhood because I know it goes by so fast. I have stopped telling myself how I should be and have started to just be, knowing that whatever works for us is right for us, no matter what anyone else says. I may ask for advice, I may follow some of it, but in the end I am going to do what is best for us, what is best for Lemon. Isn't that refreshing?! Do what works - for you. These things can apply in all aspects of our lives. These are very simple ideas, very basic ideas, and at the core of our lives. We have to focus in, become more aware, and then we can be better people outwardly. Isn't that an interesting idea - become aware and grow. Be free. What an amazing feeling. So, if you are currently struggling with something, I hope that this strange yoga post will also help you in some way. I want to have passed on this idea of awareness to you, the topic of our strange yoga class, so that you can put it into practice in your life at this moment. It is something that we all can try to do daily, maybe even hourly, so that we too can be free and grow. I am not a religious person, spiritual but not religious, and this stuff is as close to religion as I get. This is my religion and I'm happy to share it here, I hope it will find you and help - just like it did for me.